Then we had the amazing, knowledgeable, incredibly helpful and so so friendly family at Blake’s Coastal Nursery deliver this beautiful black compost. Nate (Blake’s son) couldn’t have been more patient, answering (a million) questions and giving detailed advice about what to plant and how to make it successful in this coastal region. I picked out waaaaaay too many seeds to plant and Nate pushed us to make some better, more practical choices. He also directed us to some great resources, like OSU’s Newport Extension who have done all the work in figuring out what goes in this particular area and how to keep it alive. Today, Mitch will start a Permaculture Design Certificate course online. The course will take him through an entire agricultural design plan. He will learn how to plan around any climate, and to build a plan of any size. I cannot wait for his updates on the course and what he builds as well as all the other student’s plans. Before we can plant the seeds, we need a fence to keep the pests out (it’s like a broken record). Also, the chickens will be moving outside soon into a heated coop, with a clover-covered run (also Nate’s suggestion! Along with a genius plan for how to make sure it can grow before the chickens eat it… stay tuned). 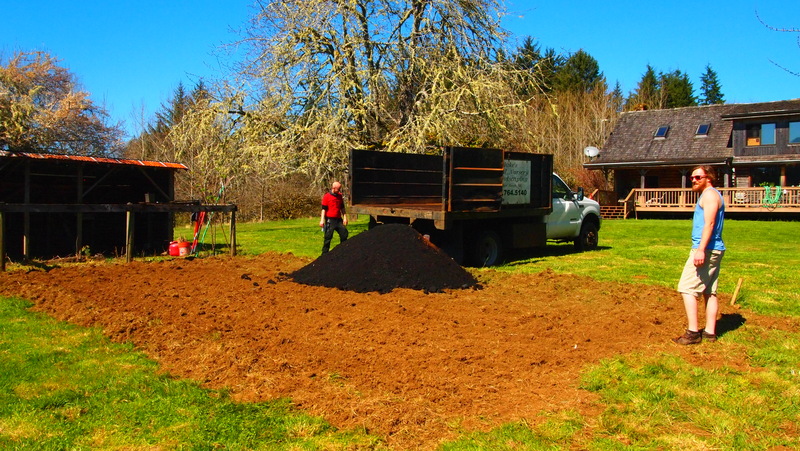 The run will lead to the garden so that we can easily let them wander through… tilling and composting for us. Although supervised so that hopefully they don’t have a chance to eat up all the new little seedlings. Farming’s biggest challenge seems to be trying to control the circle of life/food chain to protect all of our chosen plants, animals, pets and visitors from all of the many unwanted versions. We are thinking about introducing a new predator… a couple of barn cats! I hear that they are the most effective pest control for rodents and birds and that they are smart enough to keep themselves safe. But that will be the ultimate in self-control for me… making the kitties sleep outside?? It seems so mean! Guess you have to be tough to be a farmer. And patient… what am I going to do while we wait for the these seeds to spout? !